Locally sourced, truly sustainable wood and forest products from a national network of horse powered restorative forestry practitioners. DRAFTWOOD Forest Products is horse logged lumber from Restorative Forestry - The ultimate in green certified forest products. Sell locally and sustainably sourced wood products at your retail outlet. Truly sustainable wood and forest products, sourced in a way that restores the life and ecology of the forest. Draftwood has a wide variety of products, including logs, lumber, framing, exterior decking, beams, interior trim, cabinets, gourmet mushrooms, wild-crafted herbs, and more. You can rest assured that any product purchased through us comes from the most innovative and stringent Green Certification standards in the business. We believe Draftwood standards exceed every other standard in the industry, including Forest Stewardship Counsel (FSC) and Sustainable Forestry Initiative (SFI). Our products are guaranteed to have been harvested under a Restorative Management Plan, Draftwood Principles, Criteria and Guidelines. Draftwood Green Certified Forest Products have been used in L.E.E.D building projects and can provide extra points through that system for innovative certification methods and locally sourced materials. 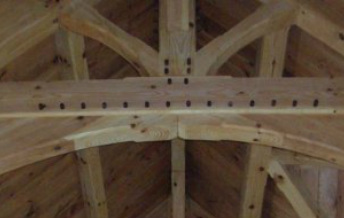 Use Draftwood Green Certified Forest Products in your next building project. Our Practitioners use ground-breaking and innovative inventory management for our wood products. Inventory is stored 'on the stump', thereby decreasing storage inputs and allowing your lumber to be as fresh as possible. This method allows the material to actually grow in value while being stored, as opposed to any other method where storage is a cost. We have millions of board feet awaiting your orders for right-on-time delivery through adequate lead time and planning. You are also invited to come see your material being harvested at any time. Ask about our Consumer Supported Forestry Program. We can harvest and process material from your own property for your own building project. It doesn't get any more locally sourced than that.